What most people think of as southwest recipes, the people of the southwest refer to as antojitos (or snacks). This includes such foods as enchiladas, burritos, tamales, tacos and tostadas. While these simple recipes are popular in this region of the United States, they are only just the beginning in terms of traditional southwestern cooking. There are many traditional southwestern recipes that go back centuries. These include such foods as slow grilled recipes and slow-cooked stews that are served with corn tortillas, beans and rice. The vegetables that are added to these recipes include nopales (from the prickly pear cactus), squashes, purslane, tomatillos, and jicamas. Guacamole is a favorite in the southwest and is made of avocadoes with seasoning. One of the most common types of seasoning for many southwest recipes is fresh cilantro (also known by the name coriander). Cilantro is often used to give a bit of a boast to fresh meals that are quick and easy to prepare. 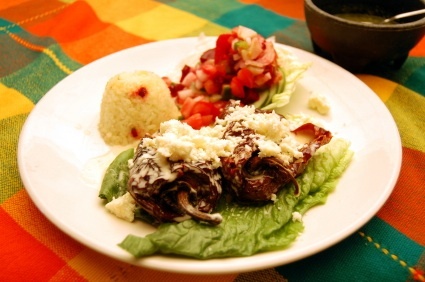 There are different food specialties in different regions of the southwest. For example, the flour tortilla got its start in the area north of the state of Sonora (northwest of the Mexico), and this is also the birthplace of the burrito. The specialty of New Mexico is the stacked enchilada while the salpicon (which is a shredded beef salad that includes vegetables) is all the rage in southwest Texas. 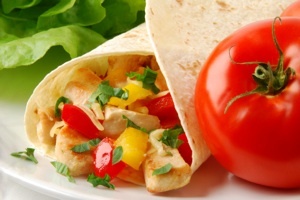 Traditional southwest recipes are made up of a variety of staple foods including beans, rice, vegetables, and tortillas. Meat and cheese are often added to many southwestern recipes as well. Red chili con carne- This is chili made with meat. The meat is simmered in a sauce that is made up of cumin, oregano, dried coriander and most importantly, dried red chilies. Green chili con carne- This is also made with meat that has been simmered in fresh green chilies, garlic, onions and tomatoes. There are a variety of meats used in chili recipes in the southwest such as beef, lamb, goat and pork, however the chili served in most dining establishments is made with beef. Chicken is also sometimes made into red or green chilies. Chili is a very personal southwestern recipe that varies from region to region and even from household to household. In most cases, beans are not included in the chili stews but are served on the side. Chili stews are very popular southwest recipes that are well loved and come well recommended for visitors to this part of the country. Chili stews are most often slow-cooked in order to help them retain their flavoring. There are areas of the southwest that are relatively close to the Gulf of California and this means access to shellfish and other types of fish to add to southwest recipes. When fish and shellfish are cooked for southwestern recipes they are often grilled in a swift manner. Chicken is common to some southwestern recipes. It is first marinated in a combination of spices and orange juice before being grilled. Steak is also sometimes marinated in this way and then used for a recipe called carne asada (which stands for roasted meat). Watch for our growing collection of southwest recipes. Copyright © 2009 by Kokopelli's Treasures. All rights reserved.